The Directors from Manchester here met the train, including Henry Houldsworth, Esq., the Chairman, the Vice-Chairman, and about eight other Directors; and, together with Mr. Stephenson, Mr. Gill, Capt. Laws, Mr, Gocch, and several other gentlemen, they went by the train at a quarter to twelve to Leeds, and returned again the same afternoon to Manchester. The train was crowded to excess, and several of the wagons intended for cattle were filled with third-class passengers. It started from Hebden Bridge at a quarter before twelve, reached Sowerby Bridge at twelve, Brighouse at 27 minutes past twelve, Dewsbury at two minutes past one o'clock, Wakefield at half past one, and Leeds at a quarter past two o'clock,—having completed the journey in two hours and a half. At Leeds the Directors took a hasty lunch, and left again for Manchester by the train at three o'clock. Owing to the causes we have mentioned, it was after eight o'clock when the passengers by this train reached Manchester. We understand that the trains have run with as much regularity as could be expected during the week, and have loaded well; there has been no accident whatever. This Stephenson 2-2-2 is similar to the early locomotives that worked the Manchester and Leeds Railway. 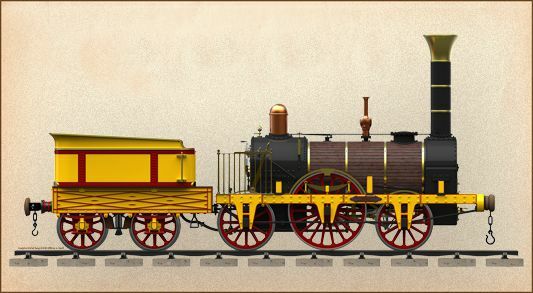 The locomotives were locally built to Stephenson's designs. In 1823, together with his son Robert, Edward Peace and Michael Longridge, George Stephenson set up a business in Newcastle to be called "Robert Stephenson and Company". They would build the Rainhill trials winner "Rocket" and go on to manufacture several thousand locomotives for world wide markets. In one form or another the business carried on producing steam locomotives up until the very last days of steam.